Although less than 100 pages in length, this work of major C. H. Douglas is unquestionably one of the most important books of this century. 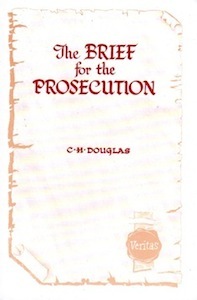 As its title indicates, ‘The brief for the Prosecution’ is an indictment of those groups and organizations responsible for the systematic sabotage of Western Civilisation as a prelude to fastening upon a bewildered and deliberately demoralized humanity, an all-powerful World Government – a tyranny of unspeakable horror. Economic policies, which have been demonstrated as a primary cause of world catastrophe, are pursued and imposed and their intensification is promised. The country is flooded with undesirable ‘refugees’, while the native born are urged to emigrate. ‘Full employment’, for the purpose of imposing an industrial civilization on countries and continents, which have expressed their determination to resist the process at all costs, is the culmination of a science which promised to transfer the Curse of Adam from the backs of man to that of the machine.